So we spent this last weekend at C2E2. It was AWESOME. We went as a family, which is often a bit more of a challenge, but we did okay. Caitlin had a fantastic time, and was still squeeing 2 days later. She loved seeing everyone dressed up in costumes, and seemed to really enjoy the convention buzz. 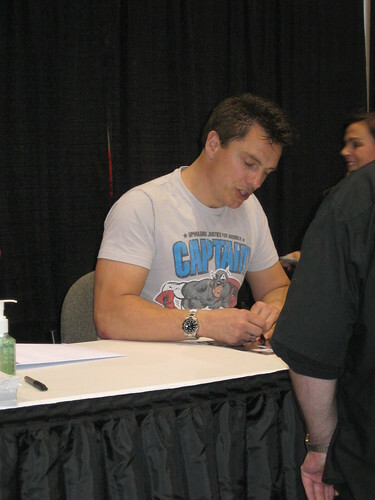 Saturday was All About John Barrowman. He did an hour-long Q&Athat was wonderful and entertaining. We waited in line for quite some time (nearly 2 hours) for an autograph, but we did indeed get one. He was warm, he was kind, and he totally gave Caitlin a Barrowman fistbump. With which she was delighted. That 15 seconds was well worth the wait. He’s just as pretty in person in case you were wondering. Potentially prettier. I took pics, but I’m a terrible photographer. Thus, you are warned. We had a bystander snap us as we got our glossy signed. It’s hard to see, but this is John saying hi to Caitlin. For more of our JB photos, here’s the Flickr Set. I’m deeply pleased that I managed to stay upright, speak in full sentences, and not squeak. Much. On Sunday, we launched Chicks Dig Comics. Amanda Conner, Sigrid Ellis (moderator! 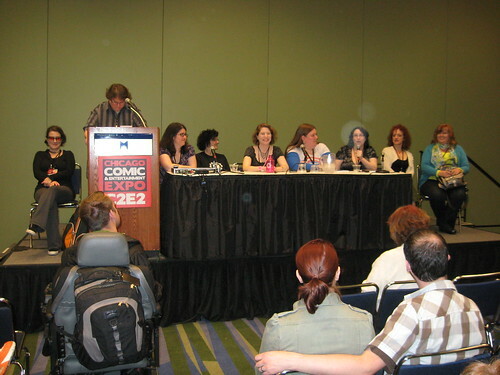 ), Caroline Pruett, Jen Van Meter, Lynne M. Thomas, Jennifer M. Smith, Tara O’Shea, Jill Thompson, and Gail Simone. And again, the Flickr photoset. Can I just say what a fun, amazing panel it was? Everyone was by turns thinky and funny. We celebrated, we critiqued, we had a blast. I want to thank EVERY ONE of our contributors who participated in the panel, and everyone in the audience who came and listened and talked and enjoyed the panel. Good times. Really, a great C2E2. Totally worth it. I did a couple of interviews while we were there too, and once those go up and I have links, I’ll post ’em. This entry was posted in appearances, Caitlin, Chicks Dig Comics, conventions, Doctor Who, Michael, shameless promotion. Bookmark the permalink.